The pear-shaped island, Sri Lanka, accommodates some holiest Buddhist pilgrimage sites with ‘the Temple of the Tooth Relic’ being the dominant attraction. This island holds more significance as it acts as a starting point for the most sacred voyage of salvation with primary Buddhist sites. The elegant beach coasts of Sri Lanka shelters several temples enhancing the beauty of the island all the more. Being a significant Buddhist site, Sri Lanka serves as the perfect place to for attaining peace and tranquility. Sri Lanka is listed among those enthralling destinations which accommodates spiritual aura as well as secludes the person from the modern chaos and even provides thrilling adventure to its visitors with natural splendor at the backdrop. Temple of Sacred Tooth: This is the most eminent temple that Sri Lanka comprises within its territory. As the name suggest itself, the temple is primarily significant because it affirms to be a pious abode of the tooth relic of the Great Buddha. 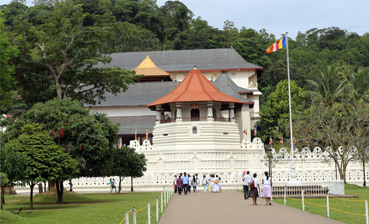 This fascinating temple is situated in Kandy and is eminent from the name of Dalda Maligawa. The temple is among the most prominent Buddhist sites primarily because of the tooth relic which is considered as the most revered object of worship for Buddhists. There are exciting stories behind the emergence of this tooth temple. It is believed that the tooth was taken directly from the glistening blaze of the great Buddha’s pyre from the cremation grounds in 543BC. It was later in the 4th century when it was smuggled into this tropical island. The Golden Temple: The temple has been accurately named as this place really glistens just as gold. This is an elegant place which is standing at the east of the rock temple. The place is said to be a monastery which was used by Buddhist monks to seek refuge. 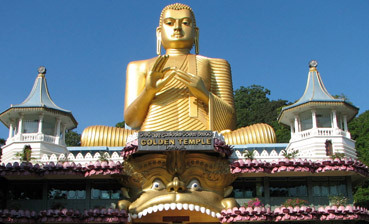 Adam's Peak: It is another most sacred and ancient pilgrimage which is a bit different from other sites. Its distinctness lies in being a conical mountain which is stepped and around 2243 meters high. The place is widely acclaimed as there is Lord Buddha’s footprint on the summit of this sacred mountain. Bogoda Bridge and Temple, Buduruwagala, Dowa Cave Temple, Muthiyangana are some other prominent Buddhist temples which showcases intricate Buddha statues, artistic sculptures of Buddha, fascinating paintings and much more of such stuffs that enthralls the visitors during their visit.